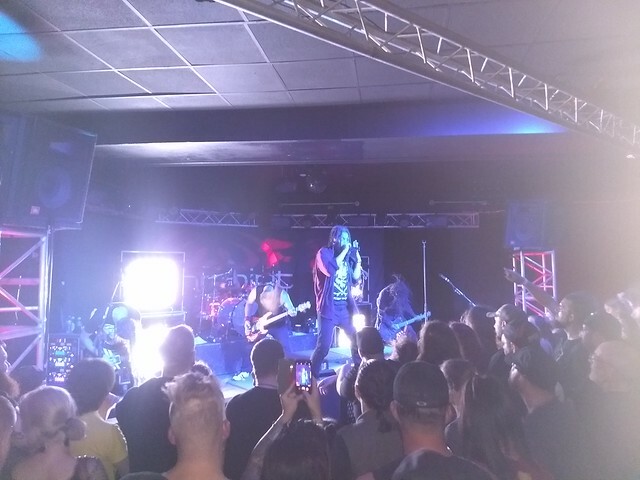 I’ll usually always make the effort to go see Nonpoint if they come to town – I’ve been a fan since Statement, and they always put on a good show. This one was no exception. This was a dual headlining run with Butcher Babies, with both bands switching off closing the show. Rochester had Nonpoint on first and BB closing this time. Probably not the right call given how popular Nonpoint is here, but such is life. Due to them being first, I got there a little late and missed the first handful of Nonpoint’s songs, but I got to see most of my favorites, plus two new songs off of the forthcoming X album, both of which rocked and hopefully are indicative of how the rest of the album will be. I met up with Dave and Danielle about halfway through the set, and we had the same observation: the older songs seemed a bit slower. Victim, Endure, and What A Day were not nearly as fast as the album, and I wanted to move more! Beyond that, the set was still fun, and the place was very full with lots of people singing along and moving. Great response for the band! My comment about Nonpoint going on first being the wrong call is informed by the fact that half the place cleared out after the set. Once Butcher Babies started, I myself lasted about three songs and thought getting home and relaxing was a better use of my time as well. I had seen BB open for GWAR a couple years ago, and I thought they were okay then, and they were just okay now. I didn’t think the songs were all that interesting, neither girls voice did anything for me, and the crowd that was left was kinda into it, but there was a lot of just standing around also. Eh, can’t win them all. Nonpoint was fun!